Update (2019): The following statement doesn’t represent the views of the Anarchist Federation as whole, either now or at the time it was written. At the time the situation, with the Anarchist Federations providing material support for revolutionaries in Rojava via our comrades in DAF, there were debates on the subject within the group. This represents one ‘side’ of those debate, and was intended to be published along side the other, more optimist view (which wasn’t completed in time). As such it should never have been labeled as a statement from the group as a whole, and those that wrote and supported it have now left the Anarchist Federation and formed a new group ‘ACG’. We keep it here for honesty, but since it is still brought up from time to time, some degree of clarity was needed. -K, Bristol AFed, 2019. The following statement addresses the situation in which Devrimci Anarşist Faaliyet (DAF), Revolutionary Anarchist Action, are involved on the Turkish/Syrian border in opposition to IS. This is a struggle which, if lost, will probably result in far greater repression and tyranny than workers in the region already face, in towns and on the land. It is also one in which class-consciousness and the class struggle must remain at the forefront of anarchist responses. Anarchists on the ground are fighting in a less-than-ideal situation, not least given that the state forces of Syria, Turkey, Iraq, Iran and the US, also claim to combat IS. We continue to offer practical solidarity through the International of Anarchist Federations (IFA/IAF). We also offer our own evaluation of the situation. The Anarchist Federation is only too aware of the support that many anarchists, including those who describe themselves as anarchist communists, anarcho-syndicalists and class struggle anarchists, are offering the “Rojava Revolution”. This includes lauding the PKK (Kurdistan Workers Party) as a party that has somehow morphed from being an authoritarian nationalist party into being a near-anarchist catalyst for social revolution in the region, and describing the situation in Rojava as similar to the revolutionary situation in Spain in 1936 (David Graeber, as well as Derek Wall of the Green Party left). Those who wish to hold on to their principles and to keep a clear head, need to examine the facts. The PKK at its birth adopted a leftist nationalist stance. This leftism was very much of the Stalinist variety. In 1984 it began an armed struggle against the Turkish state. With the capture of Abdullah Ocalan, its leader, by the Turkish state, a new period in the evolution of the PKK began. In line with leaders of other parties of the same ilk, Ocalan was and is seen as a charismatic figure to which the leadership elements and the base of the party pay obedience. Ocalan is described as “the sun” around which the various political and military organisations revolve. This situation has not changed with his apparent adoption of Bookchinite confederal municipalism. Ocalan deliberately modelled himself on Stalin right down to the personality cult. With the collapse of the Soviet Union and its satellites, Ocalan and the PKK began to manouevre, to change positions, no longer being able to look towards a discredited state capitalism. When the PKK military forces were compelled to move over the border to Syria, they met problems with the Kurdish peasantry there, many of whom still held to Moslem religious beliefs at odds with PKK leftism. This impelled Ocalan to talk about Kurdistan as “the cradle of international Islam”. At the same time the PKK entered into a tacit alliance with Syria’s Assad regime, an enemy of the Turkish state. Ocalan then completed another turn and talked about becoming Turkey’s “most powerful ally” and that “the war on behalf of borders and classes has come to an end”. When this failed to impress his captors, Ocalan then took another turn, recommending that Bookchin must be read and his ideas practised. This initiated an intensive marketing campaign by the PKK towards Western leftists and anarchists in order to look for support and allies. Apart from the strange occurrence of the PKK, after decades of Stalinised nationalism, apparently turning overnight into some sort of organisation advocating Bookchinite libertarian municipalism, it should be pointed out that this came not from the grassroots of the PKK but was handed down by Ocalan through the PKK command structure. 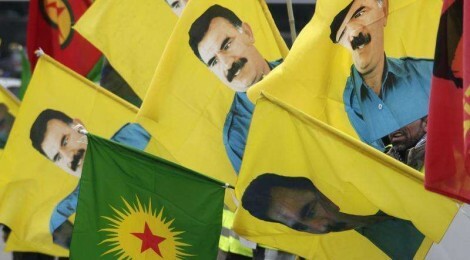 In fact, whilst Ocalan and the PKK might be posing as born again libertarians, it should be remembered that the PKK, whilst facing towards the West as advocates of direct democracy and of secularism, at the same time advocates the setting up of Democratic Islam Congresses to accommodate the Islamists and to religiously legitimise the PKK. This was also at the instigation of Ocalan. In a letter that Ocalan sent to the Democratic Islam Congress he referred to his “brother believers” and goes on to say that “we cannot be defined by western concepts such as communism and atheism”. Further he then talks favourably about the Islamisation of Kurdistan. So much for secularism! As to any change in the structure of the PKK from an extremely centralised structure with Ocalan at the tip of the pyramid into a libertarian federalist organisation controlled by the membership, there is no evidence whatsoever that this has happened. The PKK’s “Democratic Confederalism” is described by Ocalan as “a system which takes into consideration the religious, ethnic and class differences in society”, in other words the class system is not being questioned at all. The Koma Civakên Kurdistan (KCK) (Group of Communities in Kurdistan) an organization founded by the PKK to implement the Democratic Confederalism programme, defends private property in its Contract (the key document in the aforesaid programme). This is under Article 8, “Personal, Political Rights and Freedoms”. Section C of article 10, “Basic Responsibilities” defines the constitutional basis of mandatory military service:”In the case of a war of legitimate defense, as a requirement of patriotism, there is the responsibility to actively join the defense of the homeland and basic rights and freedoms”. Zafer Onat, a libertarian communist in the region remarks “While the Contract states that the aim is not political power, we also understand that the destruction of the state apparatus is also not aimed [at], meaning the goal is autonomy within existing nation states. When the Contract is viewed in its entirety, the goal that is presented is not to be seen beyond a bourgeois democratic system that is called democratic confederalism”. Anarchists can remember Gaddafi’s Green Book, which in rhetoric had far more radical language, where it says: “All that the masses need do now is to struggle to put an end to all forms of dictatorial rule in the world today, to all forms of what is falsely called democracy – from parliaments to the sect, the tribe, the class and to the one-party, the two-party and the multi-party systems…. No democracy without popular congresses and committees everywhere. … Democracy is the supervision of the people by the people.” But did anyone seriously believe that this was actually being implemented under the repressive regime of Gaddafi? The uprising against the Assad regime meant that in the course of events, that regime ceased hostilities against the Syrian branch of the PKK, the PYD (Democratic Union Party). This was in order to concentrate on fighting its other opponents, the Free Syrian Army, etc. How seriously should we take the claims about the Rojava Revolution in the Kurdish part of Syria? We should be clear that the PYD has set up a parliament structure, the Auto-Administration, which it controls with allied parties. It passed a conscription law in July compelling families in the region to send one of their 18-30 year-old members to serve in the defence corps of the PYD, for a period of six months, either continuously or intermittently over a one year period. “Non-adherence” to this law was subject to punishment as stipulated in the law. This law was passed without consulting with other political formations in Rojava and explicitly drafts Kurds into armed groups completely under the control of the PYD. At the same time the PYD is treating other Kurdish political formations in Rojava in an authoritarian totalitarian way, backed up by its use of armed force. It marginalises them and refuses entry into any decision making. The so-called cantonal assemblies and grassroots bodies are themselves under the sway of the PYD and the Auto-Administration can either approve or block any decisions by these bodies. There is no real direct democracy here, workers and peasants do not control these bodies. At the same time no genuine workers and peasants militias have developed, all of the armed groups are under the control of the PYD. Furthermore, there is no socialisation and collectivisation of the land and the workplaces, as happened, for example, in Spain in 1936. The PKK/PYD marketing campaign has presented the situation in Rojava as one of progressive revolution, but the working class and the peasantry have no autonomous organisation. Whilst there is a quota of 40% representation of women within these local councils/communes/committees, it can be seen from the above that the local structures are in fact not much different from municipal councils in the West, where they act in their role as the local state as support for and in connection with the central state and parliament. Indeed, while some compare the “Rojava Revolution” to Spain 1936 perhaps a better analogy would be the Bolsheviks in 1917 which many anarchists, both internationally and inside Russia, mistakenly supported initially as a truly revolutionary force. As regards the women’s armed groups, whilst there are signs of feminist influences within them, it should be remembered that the women’s fighting groups are segregated from male units, with no mixed fighting groups. Gaddafi and Saddam both had women’s military brigades, but that did not mean that there was women’s liberation in Libya and Iraq. Similarly women’s military brigades exist in Iran with no sign of emancipation of women. For that matter, ISIS has all-female brigades called al-Khansaa and Umm al-Rayan. What we are saying might not be popular at the moment, but we feel that our analysis will be borne out by unfolding events. 1.Argue for fully open borders for refugees and aid to these refugees. Highlight the conditions in the refugee camps and of Syrian refugees in Turkish cities forced to beg or to turn to petty criminal activities in order to live. 2. Provide humanitarian aid to Rojava via IFA, which has direct contact with DAF. 3. Encourage and support any independent action of workers and peasants in the Rojava region. Argue against any nationalist agitation and for the unity of Kurdish, Arab, Moslem, Christian and Yezidi workers and peasants. Any such independent initiatives must free themselves from PKK/PYD control, and equally from aid by the Western allies, from their clients like the Free Syrian Army, Barzani’s Kurdistan Democratic Party, and the Turkish state. The Anarchist Federation, 1st December 2014.